Last night Coach K became the first NCAA Division I men’s basketball coach to reach 1,000 wins. It was a truly amazing feat and he is likely to add to that number for years to come, but if I could have a Kanye West circa 2009 moment for a second…Yo, Coach K, I’m really happy for you…I’ll let you finish, but Pat Summitt has the best record in college basketball of all time! The best record of all time!! Hahahaha! Can you tell I’ve been wanting to do that for a while? In all seriousness, I think Coach K’s accomplishment is pretty amazing and I really am happy for him and Duke, but the win did make me think very fondly about legend that is Pat Summitt. From 1974 until 2012, Coach Summitt earned 1,098 wins as the head coach of the University of Tennessee women’s basketball team (often fondly referred to as the Lady Vols). In those 38 years she only had 208 losses, making her a winner 84.1% of the time, and never suffered a losing season. She won 8 national championships and was named the Naismith Coach of the Century in 2000. Beyond the wins on the court, Coach Summitt, won the hearts of her players and the public with a coaching philosophy that settled for nothing but excellence while being being a loving role model, coach, family member and friend. 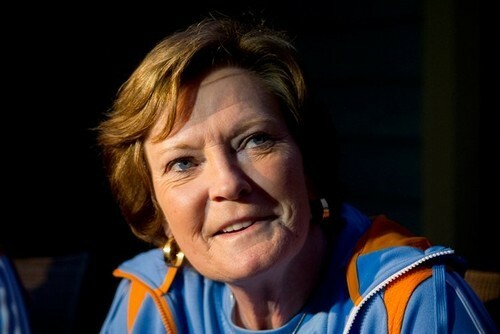 Without a doubt she will go down as one of the greatest coaches to ever lead the game of basketball. Much to the sadness and dismay of her fans, current and former players, in 2011, Coach Summitt announced that she was diagnosed with early-onset Alzheimer’s disease and would be stepping down as the head coach after the completion of the 2012 season. She would stay on has head coach emeritus at the University, but for all intents and purposes Coach Summitt’s career as a basketball coach was over. Not one to live without purpose and fight, Coach Summitt and her son Tyler created the Pat Summitt Foundation (PSF), an organization dedicated to helping to find a cure for Alzheimer’s disease. PSF awards grants to organizations that provide research, services and treatment to Alzheimer patients, their families and caregivers. Earlier this month it was announced that the PSF partnered with the University of Tennessee Medical Center and established the Pat Summitt Alzheimer Clinic. With a goal of raising $2.5 million over the next 5 years to provide care for East Tennesseans faced with cognitive disorders, Coach Summitt is ensuring that her legacy is bigger than basketball and fighting to improve the lives of those stricken with such a difficult disease. If you’d like more information about the PSF, Alzheimer’s or would like to donate, click here.